Samsung Galaxy 8GB 7" Tablet Just $48.99! You are here: Home / Great Deals / Christmas Deals / Samsung Galaxy 8GB 7″ Tablet Just $48.99! Samsung Galaxy 8GB 7″ Tablet Just $48.99! 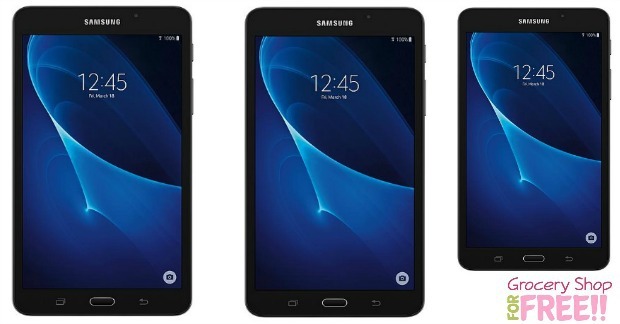 Check out this great deal on a 8GB Samsung Galaxy 7″ Tablet! You can get it for just $48.99! It’s on for $99.99, and Shop Your Way Rewards members will get back $51 in points, which will make your final price just $48.99! It’s normally $150! What a great gift! PLUS, you get FREE shipping when you choose in-store pickup! Whether you’re at home or on the go, the Black Samsung Galaxy Tab A will keep you in touch at any time. Check emails before bed, or stream videos at the coffee shop via wifi connection. The clear, convenient touchscreen makes working on presentations for the office or typing notes in class as simple as possible. This tablet has easy access to the latest apps so you can enjoy interactive games and popular streaming services right at your fingertips. With 8GB of built-in memory, store essential files and media with ease.